Among the services offered by the Nevada SHPO is support for community surveys. Community surveys are efforts by local government staff, non-profit groups, and private citizens to research and understand the buildings and landscapes within their local environment. For direct assistance in beginning a community survey, individuals or local representatives should contact the Nevada SHPO’s National Register Coordinator. However, some brief guidance and resources are offered below. The Nevada SHPO’s survey forms and guidance are available at the bottom of this page. Please note: Some of the surveys types below may not be sufficient for Section 106 (National Historic Preservation Act of 1966, as amended) compliance. Please consult the appropriate federal agency to determine the level of survey needed for a federal undertaking. Information about the Section 106 process can be found here. This is a very brief kind of survey used to get a basic sense of what types of resources might exist in a particular area. No formal documentation is compiled about any specific resources, but field notes and photographs may be taken. This is best done when very little is known about an area, and when the goal is to determine where to spend more time and effort on research. This is a fast-moving survey best used for large areas, or when documenting a potential historic district. “Recon” surveys may fill out short forms about each property in the study area, but will usually only evaluate whether those properties might be “contributing” or “non-contributing” to a larger neighborhood, commercial area, or townsite. This type of survey can be especially helpful when dealing with resources constructed after 1940 like large, master-planned housing developments. If completing this kind of survey, researchers are welcome to use the first page of the Nevada SHPO’s ARA Form to record information. It may also be helpful to compile final results in the Nevada SHPO’s District RA Form. This is a slower-moving, but more thorough, type of survey that involves a full documentation and evaluation of individual resources. This will typically result in conclusions about whether that individual building or place is eligible for the National Register on its own, as well as if there might be a larger historic district. This type of survey is best used when seeking to record detailed information about individual places. If completing this kind of survey, researchers will likely find the Nevada SHPO’s ARA Form to be a helpful tool in recording information. District RA Form (Word Version) – use for all historic districts (architectural, archaeological, or districts with both resources types). One-page Reconnaissance Survey Form (Word Version) - for use in reconnaissance-level surveys to provide basic information. Check with the SHPO for appropriate use. Continuation Sheet PDF – If using the PDF version of the form, use this form to add information that may not fit on the fillable PDF forms. Instructions for the Architectural Resource Assessment Form – instructions for filling out both the ARA and District RA Forms. Nevada Architectural Lexicon – for use in filling out certain fields on the ARA Form. Nevada Companion Bibliography – a helpful guide to resources on Nevada history, and local/regional/national architectural history. 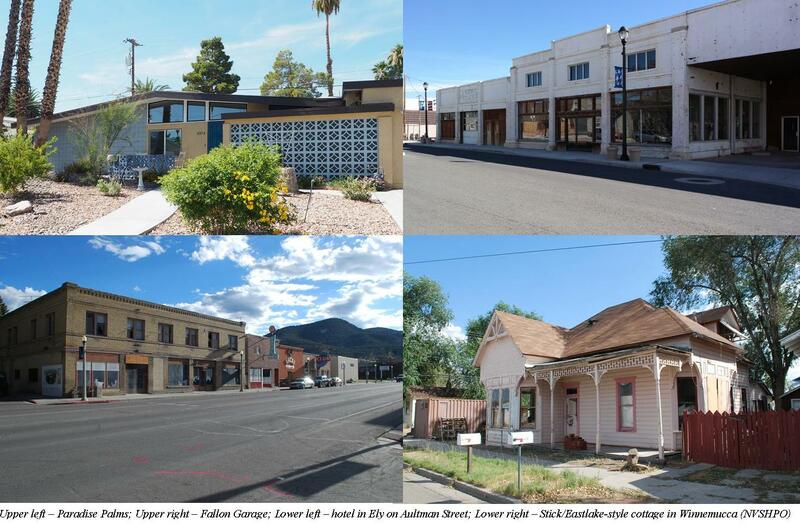 The State Historic Preservation Office and the Comstock Historic District Commission are located in the Department of Conservation and Natural Resources.